Linking Glacier Point with the John Muir Trail near Nevada Fall, the Panorama Trail allows for hikes from the point down 3,200 feet to the floor of Yosemite Valley, though at 8.5 miles, this would take most of one day and require a shuttle back to the trailhead. The Four Mile Trail achieves the same trip in less distance though does not pass the same variety of scenery. 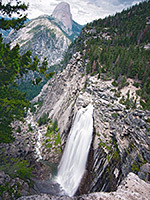 But just the first 3 miles of the Panorama Trail is an excellent half day hike, passing exceptional scenery including the least-known waterfall in the valley (370 foot Illilouette Fall), Panorama Cliff, Vernal and Nevada Falls on the Merced River, Half Dome, and many other granite peaks to the north and east. Panorama Trail topographic map, Glacier Point Road trails. 13 views of the Panorama Trail. Parking for the hike is in the main lot at Glacier Point, a place that may fill up completely on busy summer days. The route starts at the beginning of the 1/4 mile path to the main viewpoint - it leads up a slope a short distance to a junction with the Pohono Trail then heads down the hillside. 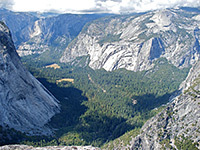 After two long switchbacks through open forest of tall pines, the path rounds a corner below Washburn Point then begins a long, straight, continuous descent past scattered trees and bushes, always with fine views over the valley of Illilouette Creek, north to Half Dome and along the Merced River. 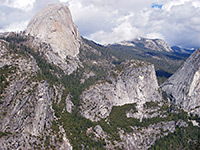 1.5 miles further is a junction with the Buena Vista Trail that leads into the southern Yosemite Wilderness; here, the Panorama Trail turns back north and winds more steeply down a wooded hillside, as the noise of Illilouette Fall becomes audible. 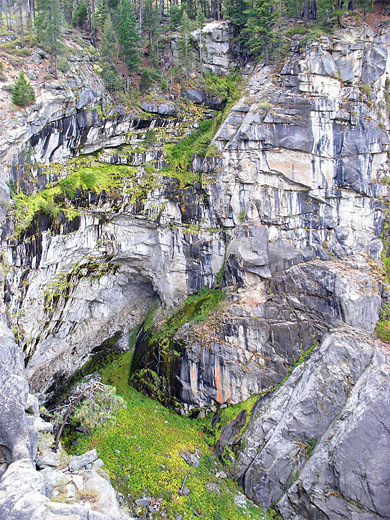 The cascade can be seen from an overlook on the edge of a sheer cliff, just off the trail, though the perspective is better from further north along the edge. The beautiful falls are somewhat hidden, facing northwest at the head of a narrow ravine (Illilouette Gorge), so are in shadow for much of the day. Illilouette Creek is a forceful torrent in spring/early summer but more graceful in late summer, when the waters drop down the cliff face as several parallel streams, complementing the vertical gray, black & white stripes of the granite - a pattern that extends some distance either side. Especially pretty are the cliffs immediately west of the fall, where the streaks are mixed with patches of bright green grass and moss, though this can only be viewed by scrambling off trail on the far side of the creek. 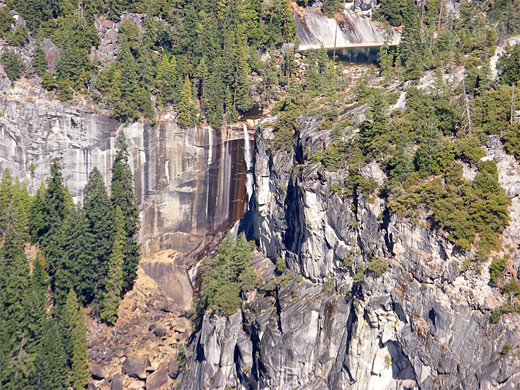 The falls cannot easily be seen any closer, as after the viewpoint the trail moves away from the cliff edge and continues its descent to Illilouette Creek, down a sunny slope and over the stream on a sturdy footbridge, about 200 feet from the falls. 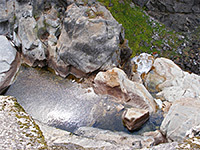 The creek flows over sections of smooth granite forming pools and small cascades, with deeper channels and potholes just before the drop though again this is not in view from the path. To the south, the views up the valley are less dramatic as there are no prominent domes, just wooded slopes and a angular ridge on the horizon - the edge of the Clark Range. East of the creek, the Panorama Trail starts to climb, through a patch of pine trees and into more exposed hillside of manzanita and other bushes - there are generally fewer pines on this side of the valley as it receives more sun and less moisture. The path next approaches the edge of Panorama Cliff at Panorama Point, where walking a short distance north reaches the edge of a 1,000 foot drop, below which is the Merced River, Vernal Fall and the upper end of Yosemite Valley. This fine view is reached about half a mile after Illilouette Creek; the next mile reveals gradually more of the Merced valley as the path reaches a high point of 6,660 feet, then soon after it begins a steep descent of 600 feet and ends at a junction with the John Muir Trail above Nevada Fall - a point 4.7 miles from Glacier Point.